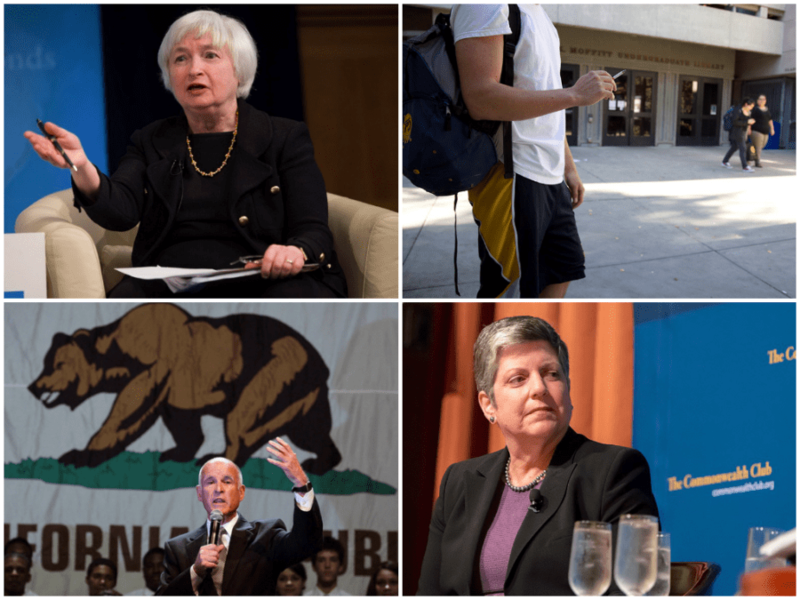 (Clockwise, from top left): Janet Yellen's confirmation as the chair of the Federal Reserve, the tobacco ban in the UC Berkeley campus, Janet Napolitano's opposition of the academic boycott against Israel alongside Chancellor Nicholas Dirks, and Gov. Jerry Brown's declaration of state of emergency of the recent drought. Jan. 1: UC Berkeley implements a new energy use policy that places expectations for energy use in buildings, develops ambitious energy-efficient renovation projects and encourages energy-wise choices on campus. Jan. 1: As of Jan. 1, UC Berkeley students, staff, faculty and visitors are no longer allowed to smoke on campus or in campus-affiliated facilities due to a systemwide ban on tobacco products. Jan. 6: The U.S. Senate confirms Janet Yellen, a professor emerita of UC Berkeley Haas School of Business, as the head of the Federal Reserve. Jan. 6: A state Assembly bill aims to improve colleges’ response to sexual assault by involving local enforcement while also providing opt-out clauses for victims. Jan. 9: Gov. Jerry Brown releases a preliminary state budget for 2014-15 that will grant the University of California $3 billion, a $142.2 million increase from last year. Additionally, the budget offers a $50 million awards program to state public higher education institutions to increase the number of Californians who will get bachelor’s degrees, increase graduation rates and make it easier for students to transfer from community colleges. But the preliminary state budget remains out of tune with UC requests, as the UC Board of Regents passed a preliminary budget of its own in November that planned for nearly twice the increase the university will actually receive. Jan. 13: Claude Steele of Stanford University is announced as the next executive vice chancellor and provost of UC Berkeley. Steele, who will be responsible for the management of campus administrative processes, including the campuswide budget process, was previously the dean of the Stanford Graduate School of Education and the provost of Columbia University. Jan. 17: Gov. Jerry Brown declares a drought emergency Friday, asking all Californians to voluntarily lower their water consumption by 20 percent and telling state agencies to prepare for worse conditions. On Thursday, UC President Janet Napolitano announced that the UC system will be working to reduce its per capita water use by 20 percent by 2020. Jan. 17: Statistics released by the campus reveal that UC Berkeley received 73,711 applications for freshman admission and 16,573 transfer applications for fall 2014, an overall increase of almost 8 percent compared to last year. Jan. 17: Gov. Jerry Brown appoints two new individuals and reappoints two current regents to the UC Board of Regents. The four individuals are Monica Lozano, Richard Sherman and current Regents Richard Blum and Norman Pattiz. Jan. 21: Berkeley City Council faces a possible referendum after its decision to pass a controversial redistricting plan that would create a new student district. On Tuesday, opponents of this new map plan to submit the signatures they have collected during their referendum campaign to put the map on the ballot. 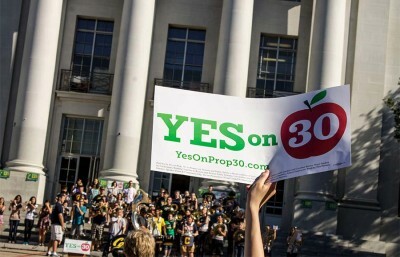 But some opponents of the referendum worry prolonging the process may not only obstruct the implementation of one particular plan but also jeopardize the city’s shot at establishing new student district entirely.